Children’s Health | Dallas ZooHoo! 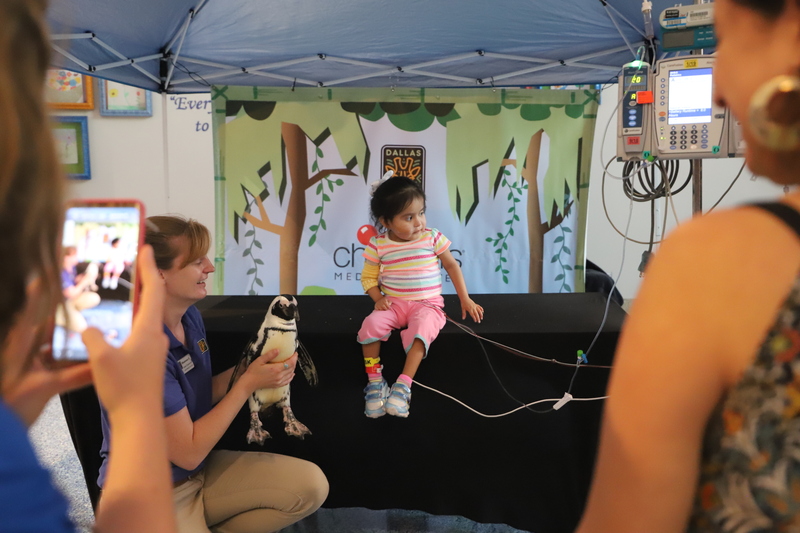 A small Children’s Health patient prepares to meet a Dallas Zoo animal ambassador penguin along with Outreach Supervisor Shannon College. Whether it’s a tamandua high up in the sky at Reunion Tower or penguins at a Texas Rangers ballgame, you never quite know where the Dallas Zoo’s Animal Adventures outreach team will go next. With just seven staff members, the team carries out nearly 1,000 animal outreach programs a year across North Texas, bringing animal encounters to places like, schools, hospitals, businesses, convention centers, and many iconic Dallas locations. Despite all the variety this team experiences, some trips are so special that they’re repeated over and over again. Thanks to the Simmons Animal Safari program, and a treasured partnership with Children’s Health established in 2014, the outreach team returns to the hospital every few months to provide magical up-close animal encounters to small patients overcoming big obstacles. The outreach team, including two-toed sloth Lola and African penguin duo, Sid and Jazz, arrive with the humble goal of encouraging smiles while gifting a special experience to those families who have more on their plate than planning a trip to the Zoo at this time. Excitement filled the room as the children enjoyed the animals on stage. Following the animal presentation, families are encouraged to come up close and commemorate the experience with a photo with an animal ambassador. 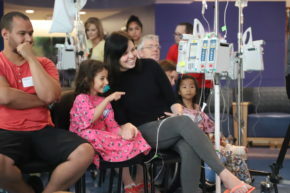 Leslie watches on as the patients eagerly line up to have their moment at the front of the stage, “It’s so wonderful to see the excitement on the kids and their families’ faces when they get to see the animals so close!” she gushes. At the close of the presentation, one last parting gift is revealed, each family is given tickets as a standing invitation to visit the Dallas Zoo. We look forward to many future visits to Children’s Health, bringing enjoyment to these extraordinary kids and their families with each animal encounter. 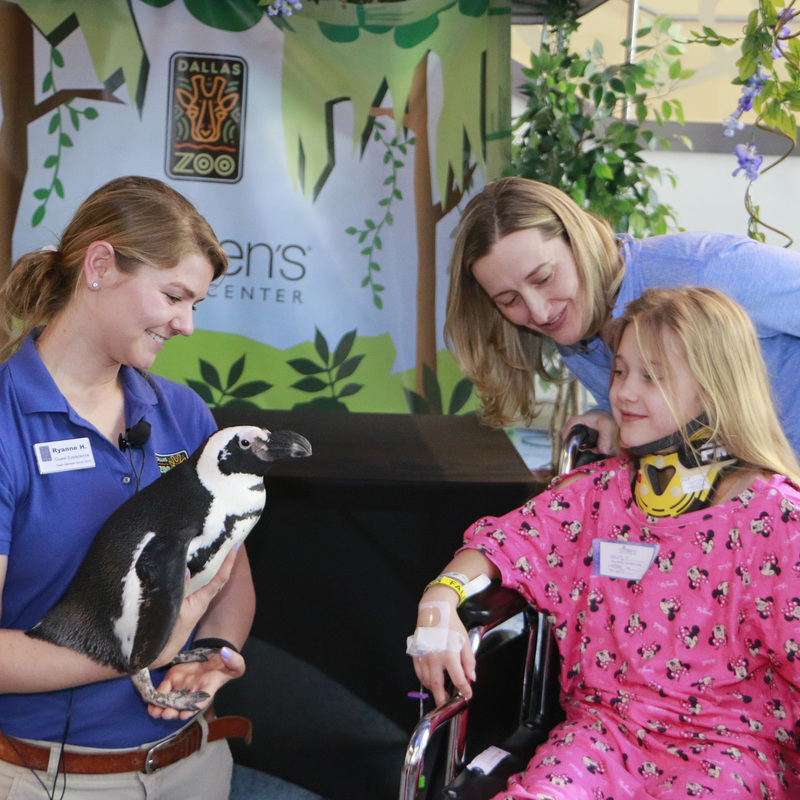 The Dallas Zoo’s wonderful partnership with Children’s Health, one of the top pediatric health care providers in the nation, allows us to take patients’ minds off of the treatment they’re undergoing. Through the Simmons Animal Safari program, we’ve traveled to the hospital since 2014 for magical up-close animal encounters. The Zoo recently paid a visit to Children’s Health with animal ambassadors who brought the smiles, including an opossum, a tamandua (also known as a lesser anteater), and an African crested porcupine with giant quills. Patients and their families sat eagerly, waving animal-themed masks as they waited to meet each new creature. As the Zoo’s Animal Adventures outreach team shared trivia and engaged with the kids, even hospital staff paused to see the show. Engrossed in the moment, the kids animatedly shouted answers and shifted in their seats to see who they would meet next. The room came alive with excitement, spreading smiles from face to face as each animal ambassador said hello. As penguin duo Sid and Jazz waddled into the spotlight, the room collectively gasped in delight, thrilled to meet two of our most beloved ambassadors. The kids enthusiastically asked questions as they learned about the Zoo’s African penguins. At the end of the presentation, patients and their families had the opportunity to take a photo with Sid or Jazz, capturing this moment forever. As these brave families said their goodbyes to the animal ambassadors, we gifted them with one more surprise – each family was given tickets to the Zoo, including the patients who couldn’t make it down to meet us. 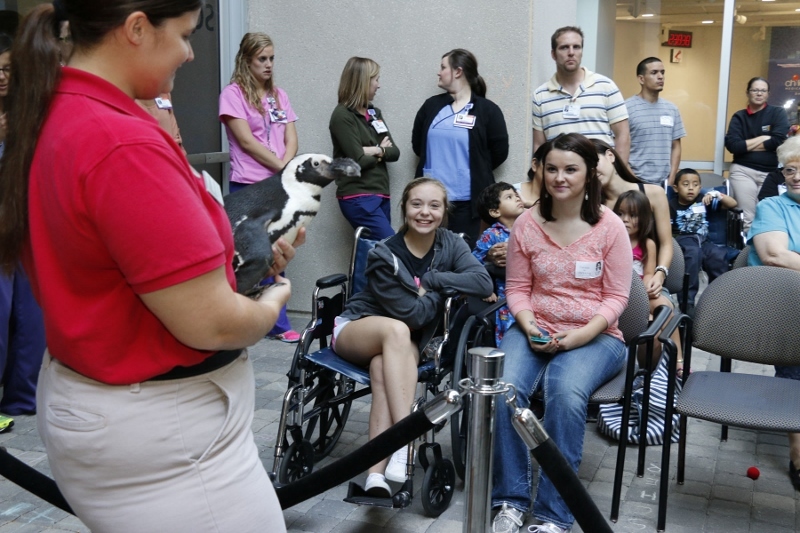 We look forward to many future visits to Children’s Health, bringing enjoyment to these extraordinary kids and their families with each animal encounter. With the help of a penguin, African serval cat, an anteater and other creatures, patients at Children’s Health in Dallas are laughing, smiling and getting their minds off of the treatments they’re undergoing. 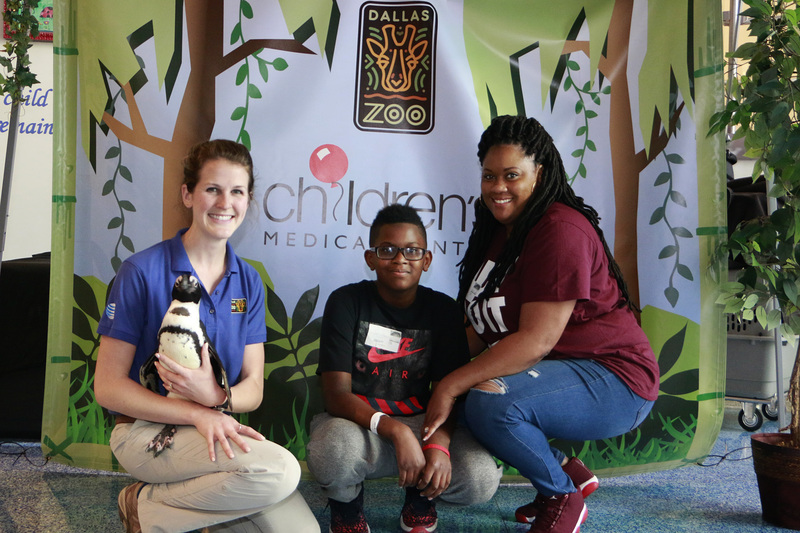 The Dallas Zoo and Children’s Health have joined to bring live animal encounters and educational programming to the young patients and their loved ones. We’re also providing the hospital with Zoo tickets to share with families, because there’s nothing like a Dallas Zoo outing for a break! Our first Simmons Animal Safari program kicked off last summer and we’ve loved every minute of bringing enjoyment to these remarkable families. We’ll return again Feb. 26 with more feathery, furry and scaly friends. We think you’ll love these photos from our last two visits.